Edible flowers, such as the petals from roses, are very popular in Persian cuisine — the floral flavour works well with other Middle Eastern ingredients such as pistachio and lemon. 1. Preheat the oven to 190ºC, gas mark 5. Line a 12-hole muffin tin with paper cases. 2. Place the butter, sugar, lemon zest, eggs, flour and 100ml of the coconut cream in a large bowl and beat with an electric hand whisk until pale and fluffy. 3. Divide the mixture between the paper cases and bake in the oven for 12–15 minutes until golden and set. Transfer to a wire rack and leave to cool completely. 4. Meanwhile, mix together the remaining coconut cream, soft cheese and icing sugar. 5. Without removing or cutting through the paper cases, cut each cake vertically through the middle then spoon in the soft cheese mixture followed by the lemon curd. Sprinkle over the rose petals and dust each cupcake with a pinch of icing sugar. 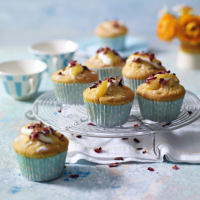 Try swapping the rose petals used to top these cupcakes for other delicate, fragrant ingredients such as dried lavender, desiccated coconut or poppy seeds.